Mininet Dashboard has been released on GitHub, https://github.com/sflow-rt/mininet-dashboard. Follow the steps in Mininet flow analytics to install sFlow-RT and configure sFlow instrumentation in Mininet. Top Flows - Click on a peak in the chart to see the flows that were active at that time. Top Ports - Click on a peak in the chart to see the ingress ports that were active at that time. Topology Diameter - The diameter of the topology. See Writing Application for more information. Thank you for the correction. I have updated the instructions in the article. what if i have my own topology, in example customtopo.py and i want to run in sflow.py ?? 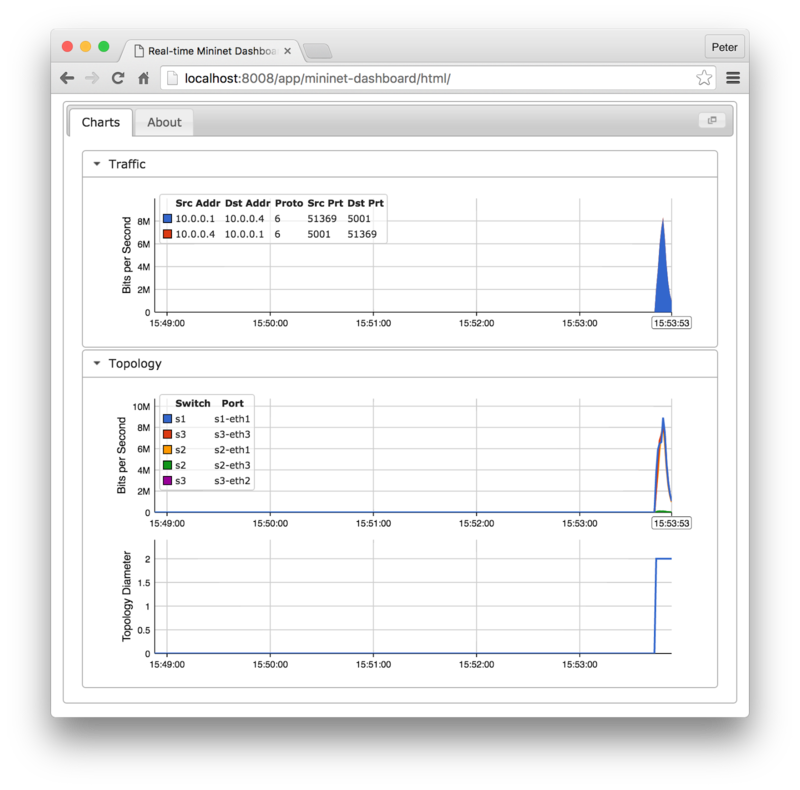 You might also be interested in the Mininet dashboard application for sFlow-RT. I have same question with it. In this example sFlow-RT is running on the command line, so just type CNTRL+C to stop it and then run ./start.sh again. Hello Peter, I have problem with detecting elephant flow in running mininet-dashboard app. I must edited topology command, because I am working with ryu rest QoS. Problem is after iperf test between h1 and h2, I do not get events about detected elephant flow. Your topology doesn't have any inter-switch links and so the link:inputifindex expression in your flow definition won't return a value and so the flow will not be tracked. I ran the script (with the setFlowHandler function you added) from stackoverflow. The script works. You may need to run a second iperf test since sFlow-RT is data driven and requires a stream of packet samples to flush flow records. sFlow-RT has a built-in http client that you can use to interact with REST APIs. ONOS measurement based control provides an example. hi,,, thanks for the post,,, does sflow just sampling packet header for the end-to-end switch ? i have a topology with mininet and i just can get header sampling(flow sample) from ene-to-end switch that connected to my hosts not for the central switches. i can get counter sample from all switches but cant get flow sample from center switch. is there any problem with my mininet? Could you explain what you mean by "end-to-end switch" and "central switch"? Did you use one of the standard Mininet topologies?